Engineering students from Bristol University have achieved success in two Royal Academy of Engineering (RAEng) schemes designed to promote innovation and leadership. On April 5, 2017 Lottie Macnair, Patrick Gregory, Matthew Mears, Robbie Herring and Oscar Radevsky – all final year students on the Engineering Design Programme – were one of five winning teams in the Engineering a Better World Student Innovation Competition and will represent the UK at the Global Grand Challenges Summit to be held in Washington DC in July. In the same week, five third year students – Matthew Curtis, Olivia Daniel, Alex Mulroy, Peter Simmons and Enrico Varano, also from the Engineering Design Programme – secured one of this year’s RAEng Engineering Leaders Scholarships, which are given to around 35 students nationally. The aim of the Engineering a Better World competition is to develop solutions to meet the UN Sustainable Development Goals and/or America’s National Academy of Engineering Grand Challenges. The competition showcase held on 5 April saw teams from 18 universities across the UK pitching their ideas to judges from the Royal Academy of Engineering. The five winning UK teams will compete against students from the US and China in the Global Grand Challenges Summit in Washington DC in July. The Bristol team’s idea, called ‘Wayaround’, is a Google Maps style personalised travel planning service for people with mobility impairments. Currently, transport planning tools such as Google Maps lack vital information on accessibility. Wayaround, however, is a complete route planning service that addresses the specific needs of those with impaired mobility. It takes data on steps, venues, pavement widths, heights, road surfaces, crowds and other issues from a variety of sources to create routes that meet the specific needs of the user. This information can also be fed to urban planners to identify areas in cities that are difficult to access, providing guidance on the design of future developments. 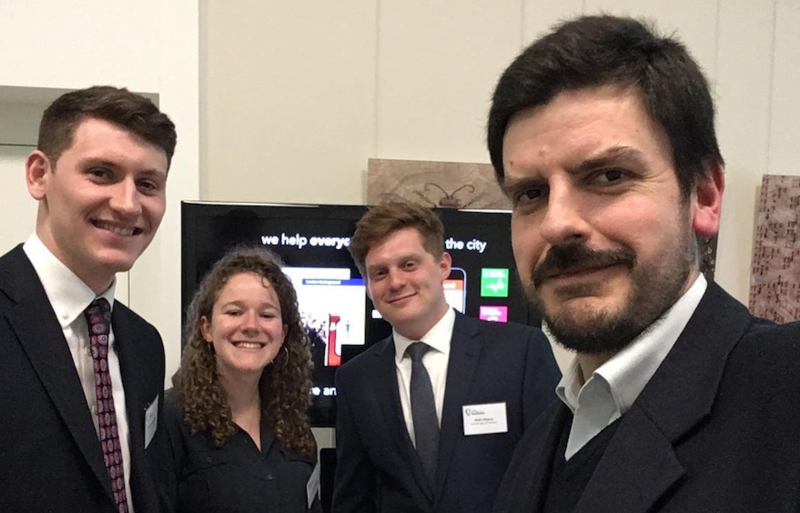 Dr Theo Tryfonas, a Reader in Smart Cities from the Department of Civil Engineering and the students’ mentor, added: “The UK competition was really tough and the fact that Wayaround secured one of the top spots is a testament to our students’ skills, determination and passion for positive change. The RAEng Engineering Leaders Scholarships allow ambitious, inspiring engineering undergraduates – who want to become leadership role models – to undertake an accelerated personal development programme. To achieve this, the winners receive £5,000 from the RAEng towards training and experience, over a period of three years, to fast track their engineering careers. Following preliminary selection through a written application process, 70 students were invited to the final selection stage at the RAEng in London. This involved a day of interviews and group activities to evaluate not only their leadership potential, but also their drive and commitment to making a positive impact on society through their future engineering careers. Although the support available through the scheme includes assistance from the RAEng in creating personal development plans, the students already have firm ideas for how they would like to use the award. Alex Mulroy, Matthew Curtis and Peter Simmons, all specialising in Civil Engineering, are keen to develop skills in sustainable infrastructure design through conferences, courses and relevant work experience. Olivia Daniel and Enrico Varano, both specialising in Aerospace Engineering, plan to use the scholarship to investigate how their aerospace engineering knowledge can be transferred to other applications.